This original and rare painting, valuable for the unusual choice of medium, was probably realized on a specific request of a refined collector. 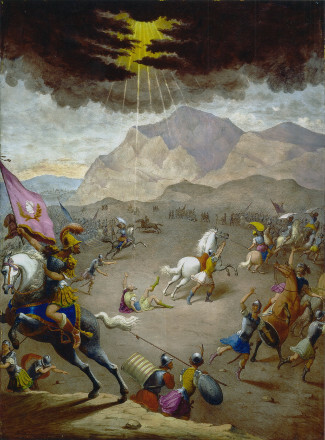 The stylistic analysis of nimble and agile figures, which give life to the "Conversion of Constantine", or "Saint Paul", thrown off by the appearance and dazzled sky, personified by sunlight shining through black clouds with straight lines. The perspective is simplistic, and the figure of the protagonist is placed in the center, but the viewer's attention is drawn mainly from the figures in the foreground, with the prancing horse's flag, which acts started as a backdrop. This scene denounces, particularly in the aforementioned character and other emerging outlined in 'allround', a specific expertise and strong types, taking us back to the hand very convincingly by Antonio Tempesta. In fact, there is a generic influence from Vasari, Antonio's master, and other Mannerist such as Stradanus, other figure in his basic training. So if due to the hand of Tempesta, the execution of this glass should fall before he undertook the work of engraving, of which three volumes are devoted to the issues warlike, providing a rich repertoire of images that will tap into the future "battaglisti" in Seventeenth Century.